Dubai's new tram project is called the Al Sufouh Dubai Tram System, and is an RTA public transport initiative. The tramway will service between 180,000 and 220,000 commuters living in or near the Dubai Marina (Marsa Dubai), JBR, and Al Sufouh (Al Sofouh, Al Safouh, Al Suffouh, etc) areas of Dubai. Initially the tramline route was to run between Mall of the Emirates and Dubai Marina Mall, prompting the nickname "The Shopping Trolley" or "Dubai Shopping Trolley". As of 2013, the tram line path has been revised to run from JBR past Dubai Marina Mall to Dubai College or Dubai Police College in Phase I, and extended to Souk Madinat Jumeirah, Burj Al Arab, and Mall of the Emirates for Phase II. The first phase of the tram system was expected to start operating in September 2009, with construction contract to be awarded in January 2008 and construction beginning in the first quarter of 2008. As with many Dubai projects, that turned out to be overly optimistic and a revised completion date is expected to be sometime in 2011 or 2012 2014 (see below), with initial work started in late 2008 or January 2009. The tram route will connect with the Dubai Metro Red Line at Dubai Marina and JLT stations, and connect (sort of - might be a short hot walk) with the Jumeirah Palm monorail to the Atlantis resort hotel. Al Sufouh Tram appears to have been renamed as the Dubai Tram, or Dubai Tramway. 15 Dec 2013 - the first tram arrived in Dubai at the beginning of December, and a trial run is scheduled for the end of December along a 2km stretch of the tram track. Official start date of the tram service planned for November 2014. Total length of the Dubai Tramway is 14.6km, with Phase I operational length of 10.6km from Dubai Marina to the Tram Depot near the Dubai Police Academy according to press release, but 10.6km from Dubai Marina to Al Sufouh Station according to RTA route map. Unlcear which is correct, but not clear if Phase I passenger operations go as far as the Tram Depot. Total number of stations is 17 with 11 of them opening in Phase I. Passengers transported expected to be about 27,000 per day initially, increasing to 66,000 per day by 2020. Train length is 44 meters with capacity for 300 travellers. Cabin configuration is similar to the Dubai Metro with a First Class cabin, Silver Class cabin, and a women and children only cabin. Contact the Dubai RTA or Serco about employment on the Al Sufouh Dubai Tram project, or wait and see if positions are advertised in newspapers or with recruitment agencies in Dubai. The Dubai RTA is the Dubai government transport authority. Serco have been contracted to operate the Dubai Tram. 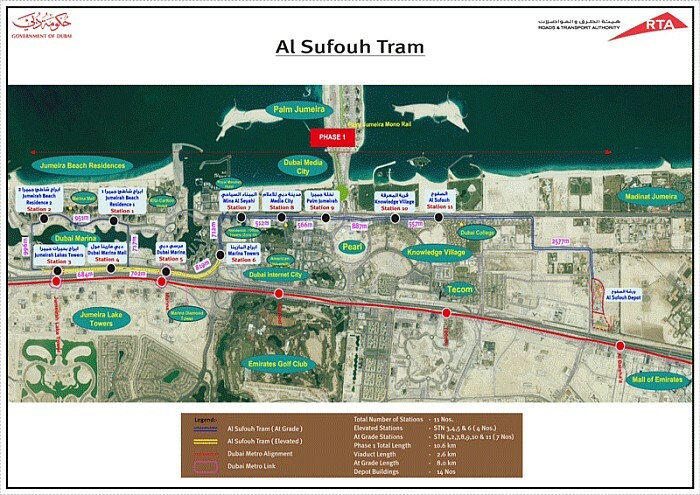 RTA supplied route map for the Al Sufouh tram route Phase I due to start operating by Nov 2014. Based on supplied RTA route map information (date unknown), but not confirmed. Stations 1-11 are for Phase I between Dubai Marina JBR and Al Sufouh station between Knowledge Village and Dubai College. Distance to next station. For Al Sufouh Station, distance is to Tram Depot. Return journey distance between Stations 5 and 1 is about 1,200 m (1.2 km). Stations highlighted in red are connecting interchanges with the Dubai Metro Red Line stations. 01 Nov 2013 - Dubai Public Transport Day (free public transport), includes Dubai Tram Show from the Gold Souq to Al Sofouh, 1600-2300, not a tram though, is a bus painted like a tram. Opening date of the Al Sufouh Tram has been delayed until late 2014 according to a report in The National 29 September 2010. Abdul Al Hassan, Director of Rail Planning and Development at the Dubai RTA said "Because of the recession we had to re-plan and reschedule. This is true for all projects in Dubai, not only transportation,"
The RTA awarded a 13 year maintenance contract for the Al Sufouh Tram operation ("Al Safouh Tramway") to the consortium comprising Alstom (France) and Cofely-Besix (UAE-Belgium). The contract includes a 5 year extension option. Contract value is AED 851 million (unclear if that is with or without the extension option). The contract covers Phase I of the project which is the supply of 11 trams, and construction of 10 km tramway and 11 passenger stations. Phase 2 optional extension includes an additional 14 trams, 5km of track, and 6 passenger stations. The contract also includes maintenance, repair, support, renewal of trams and tracks, communications, ticketing system, passenger stations, etc. Trams will run for 18 hours per day according to the news release. Phase I is a 10 km route from Dubai Marina to Village with 11 passenger stations. Phase II will add 6 stations for a total of 17 passenger stations (previous information indicated there would be 19 stations in total). There will be direct connections with 3 of the Dubai Metro Red Line stations along Sheikh Zayed Road, and a connection with the Jumeirah Palm Monorail. Each tram will be 44 meters long with 300 passenger capacity. Phase I will have a total of 11 trams. Phase II will add 14 trams for a total of 25 trams with total capacity of 5,000 passengers per hour in each direction. 11 February 2012 update (WAM news release): a 13 year maintenance contract for the Al Sufouh Tram operation was awarded by the RTA to the consortium comprising Alstom (France) and Cofely-Besix (UAE-Belgium). Bidders for the contract included Alstom (France), Ansaldo (Italy), Marubeni Corp (Japan), Leighton Holdings (Australia), and Siemens (Germany). Construction and development contracts were awarded to Alstom and Besix (Belgium), Parsons (USA) and Sistra (France). The preliminary design study started in June 2007 and it is hoped that the tram will become a tourist attraction, as well as easing traffic congestion. The tram route will be integrated into Dubai's wider public transport network with links to public buses and the Dubai Metro. The RTA (Road & Transport Authority Dubai) is in charge of the development of the Al Sofouh Tram Project, along with other planned rail solutions for public transport in Dubai. The Al Sufouh Tram route will be from Dubai Marina, Jumeirah Beach Residence via Dubai Media City and Knowledge Village to Madinat Jumeirah, Mall of the Emirates and Burj Al Arab. Tram capacity will be 5200 passengers per hour in each direction. The tram should also provide access to Ibn Battuta Mall. About 19 stations are planned for the 14 km tram route, including 3 interchange stations with the Red Line of the Dubai Metro at Mall of the Emirates, Dubai Marina and Jumeirah Lake Towers. The Al Sofouh Tram network will also connect to the Jumeirah Palm Mono Rail eventually. Value of the project is about AED 2 billion. The Al Sofouh trams will have drivers since they will be on normal roads with traffic (the Dubai Metro is driverless). Eventually there will be 270 km of tram network in Dubai on 7 different tram routes, costing about AED 9.2 billion. Completion scheduled for 2020. Some information from Gulf News interview December 2007 with Engineer Abdul Majid Khaja, CEO of the Rail Agency at the RTA. Tram route length of 14.7 km along Al Sufouh Street with 19 stations. Phase one is 10.7 km from Dubai Marina (Marsa Dubai) to Mall of the Emirates, project cost AED 4 billion, 13 stations. Project will have 25 carriages with capacity of 400 passengers in each carriage (not clear if this is an accurate figure, seems very high). About 5,000 passenger per hour transport capacity. The Dubai RTA announced that construction of the "Al Safouh" Tram project is at 30%, and the Alstom-Besix Consortium have agreed to increase the rate at which work is being completed (press release 02 April 2011). Stage one completion scheduled for 2014, consisting of a 9.5 km track from Dubai Marina to Mall of the Emirates, to be extended to 14 km. Tram route will include 19 passenger stations with 9 of them to be completed as part of Phase I. Each train will be 44 meters long with capacity of 300 passengers in three classes - Gold Suite First Class, Silver Class, and separate women and children section (similar to the Dubai Metro). Phase I will have 8 trams in operation, Phase II will see another 17 trams added for a total of 25 trams with capacity of 5,000 passengers per hour in each direction. The tram route will link with three Dubai Metro Red Line stations on Sheikh Zayed Road, and the Jumeirah Palm Monorail. Al Sufuoh Tram Phase II delayed pending status of Jumeirah Hills development, and other road works in the area. Constructions of Al Sufouh Tram stations to begin in December 2009. Completion of Phase I expected by April 2011. Phase I route through Al Sufouh, Dubai Marina, Dubai Internet City, and Dubai Media City with 13 stations. Phase I contractor is the ABS Consortium made up of Alstom, Besix, and Serco. Phase II route length 5km, will have 6 stations, tram will run past Burj Al Arab and Jumeirah Beach Hotel, links with the Red Line Metro at 3 stations on Sheikh Zayed Road (our guess is First Gulf Bank, Mall of the Emirates, and Sharaf DG stations), and the Palm Jumeirah Monorail at Al Sufouh Road Station. Information based on comments by Abdul Redha Abu Al Hassan, Director of Planning and Development at the RTA Rail Agency, reported in Emirates Business 24/7 12 May 2009. Phase I is 10 km from Dubai Marina to Knowledge Village (where the obvious road works are during 2011-2012). Links with Dubai Metro at 3 stations along Sheikh Zayed Road. Not clear which stations but previous information indicated they would be JLT, Dubai Marina, and Mall of the Emirates. Will also link with the Jumeirah Palm monorail. MVA Consultancy recommended the tram service as part of a transport study for the Al Sufouh area. MVA are based in the UK and have an office in Dubai. They are also involved with the Dubai Metro project. Consultants are Systra (who are also involved with the Dubai Metro). MVA were commissioned by Systra in May 2007 to provide the traffic management plan for the Al Sufouh Tram Project. MVA is a subsidiary of Systra. The first Al Sufouh tram route was proposed in 2005, running from the Burj Al Arab metro station on Shaikh Zayed road, down Umm Suqeim road to Madinat Jumeirah, along Al Sufouh road to Dubai Marina and back to Sheikh Zayed road at the Jumeirah Lake Towers metro station. A planned extension to the Al Sufouh tram will run along Jumeirah Beach Rd from the Burj Al Arab to Union House (at the Al Diyafah St end of Jumeirah Beach Road). Alstom of France have been reported as interested in supplying its Citadis trams to Dubai for tram networks. They have supplied trams for other Systra projects. MEED (a Middle East business magazine) reported in December 2007 that Alstom (France), Ansaldo (ITALY), Marubeni Corp (Japan), Leighton Holdings Ltd (Australia) and Siemens (Germany) were companies that were part of the three groups bidding for the Al Sofouh tram design-and-build contract. The contract was awarded to an Alstom-Besix partnership. A 4 km tram network is possibly under consideration for the Bur Dubai area. Downtown Dubai Tramway - a tram route planned or being considered around the Burj Khalifa area? www.skyscrapercity.com/showthread.php?t=523593 - Skyscrapercity forum page(s) about Al Sufouh Tram and Downtown Dubai tram. www.dubaifaqs.com/al-sufouh-tram.php (PDF and print version).